Once again saving the biggest of the Round-Up’s till last it was a busy weekend with two County Cup Finals taking place as well as a host of county league matches. Sunday beginning with an 11am kick-off at The County Ground Letchworth for the Hertfordshire Women’s Challenge Cup Final. An early start for Women’s Football East too travelling to watch the game. 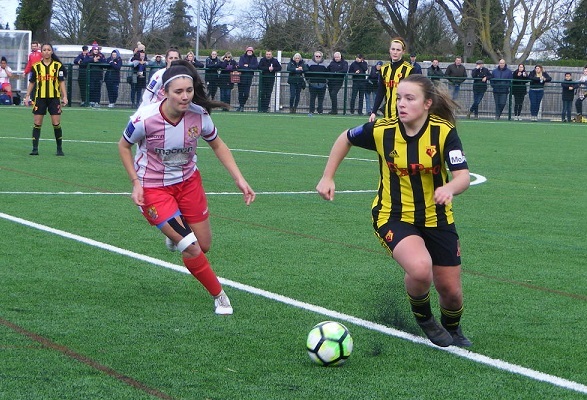 Stevenage Ladies into a fifth successive final have won 3 out of the last 4 including back to back wins, were looking for a 3rd win as they looked t retain the trophy against Watford Ladies U23s. The County Ground with a new 3G playing surface as well as redevelopments to the clubhouse. Bright sunshine Watford’s young side starting brightly pressing the ball defender Sydney Hinchcliffe firing them into the lead the ball cleared off the line from a corner struck back in over the line. Stevenage responded well Watford coping doubling their lead late in the first half Andie Dickens firing a shot in from the top of the area. 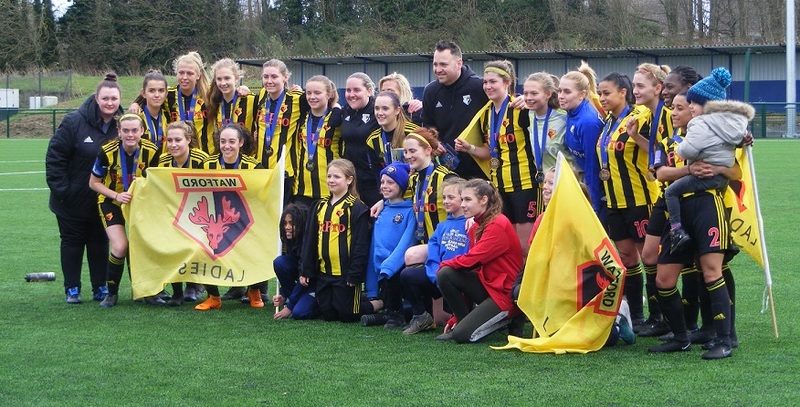 In neighbouring Bedfordshire on Sunday afternoon their was also Women’s County Cup Final action, with Luton Town Ladies meeting Bedford Ladies at Ampthill Town FC. Luton Town Ladies dominant in recent seasons that run ended by Bedford Ladies last season. The sides meeting again this season Bedford Ladies playing in the ERWFL Premier Division looking for back to back successes. Luton Town Ladies having a tough season battling at the bottom of FAWNL South East Division One. Few chances in the game early on the game livening up with 28 minutes gone Bedford striking the post, Eden Kibron firing in from close range moments later to put Bedford into the lead. Luton pressing for an equaliser it wouldn’t come shots saved Bedford Ladies with the narrow victory winning the Bedfordshire Women’s County Cup for the 2nd successive season. Congratulations. The title race remains as strong as ever in Beds & Herts Women’s Division One with the top two gaining 3 more points along with Hemel Hempstead Town Ladies who climb up to 3rd with games in hand. Northwood Ladies top of the table with a good away win against St Albans Ladies last time out were on the road again this weekend taking on Sharnbrook WFC. Emma Steele continuing her great form in front of goal for Northwood scoring a hat-trick on Sunday to take her account to 19 for the season. Goals too for Leanne Jones, Danielle Tyler and Zamina Rahemtulla in a 6-1 victory. Millie Scott with the goal for Sharnbrook. 2nd placed St Albans Ladies awarded the 3 points over Houghton Athletic Ladies remain a point behind Northwood. Hemel Hempstead Town Ladies move into 3rd position 3 points behind the leaders with 3 games in hand. A strong position they were at home on Sunday in Division One taking on Sherrardswood Ladies. A brace from Charlotte Rose along with goals from Charlene Turturici-Clarke and a 1st of the campaign for Amy Bentall securing a 4-0 victory. A great weekend for Hitchin Belles in Beds & Herts Women’s Division Two as they win at home and see their rivals drop points to open up a 5 point lead at the top of the table. A tough game for Hitchin Bells on Sunday at home against 4th placed Royston Town Ladies Development a close run reslut Kierra Gabriel and Hannah Tofts scoring for the visitors. Hitchin Belles with a potent attack this season 4 players into double figures 3 of them were on target with a goal each to see the game won 3-2 with, Keira How, Amy Jack and Charlotte Peters all celebrating. Hitchin Town Ladies in 2nd spot going into Sunday’s match were away to 5th placed Evergreen Ladies, the hosts scoring through Natalie Maher just past the half hour. That goal proving to be the winner as Evergreen battled to keep Hitchin Town from finding a reply. That result coupled with a win on the road Letchworth Garden City Eagles a 4th straight win with one result a walk over sees them up into 2nd place themselves in Division Two. Were taking in Wheathampstead Wanderers Ladies on Sunday. Goals from Tayla Murray, Katie Smith and a 1st of the season for Simone Leah Straughn sealing a 3-0 win for the visitors. Who like Hitchin Town Ladies have a game in hand on Hitchin Belles. A big game at the top of Beds & Herts Women’s Division Three this Sunday with the top two going head to head with just a point between them. AFC Dunstable Ladies Development with the narrow advantage hosting 2nd placed Woburn & Wavendon Lionesses. Dunstable unbeaten dropping just 2 points so far and those back on the opening day, Woburn & Wavendon losing just the once that early in the season in the reverse fixture with Dunstable. Giselle Randell firing Woburn & Wavendon into a 20th minute lead. The visitors holding the narrow advantage at half-time, Dunstable getting back on level terms on the hour through Nicola Hollick’s 4th goal of the season. The scores level with less than 15 minutes left Bianca Vassell, Dunstable’s top scorer scored to put the hosts 2-1 up with her 30th goal of the season. The three points guaranteed in the final minute with Hollick on target for her 2nd of the game to see Dunstable go 4 points clear at the top winning 3-1. One goal in it between Kempston Rovers Ladies and Langford Ladies on Sunday. Langford’s Amber Clark claiming her 20th goal of the season securing the 3 points to take Langford back into 3rd place in the Division Three table. A high scoring draw seeing the points shared on Sunday in Division Three between Stotfold Juniors Ladies & AFC Kempston Town & Bedford College Ladies. Molly Norman making her 1st start for Stotfold Juniors scoring a hat-trick. Holly Konopka also on the score sheet with a goal. 4 for Stotfold Juniors. 4 too for the visitors with Kayleigh Humphries making her 1st league start scoring a hat-trick along with an 18th goal of the season for top scorers Chloe Urbanowicz. At last a first league win of the season for Bedwell Rangers Ladies, their first 3 points of the season coming away from home against 2nd bottom Buntingford Town Ladies. Two players completing hat-tricks in the match Jessica Sullivan with 3 more has 12 now for the season. Leah Tomlin netting 3 goals too one from the penalty spot. Rachel Young with a brace too for Bedwell with Alicia Fieldsend also scoring in a 9-0 with that takes Bedwell off the bottom. 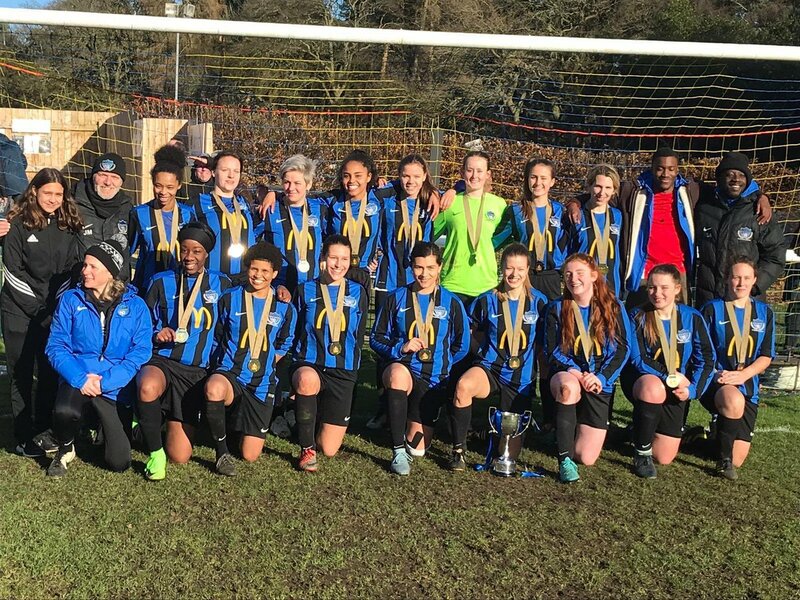 This entry was posted in Bedfordshire Women's County Cup, Beds & Herts Women's Division One, Beds & Herts Women's Division Three, Beds & Herts Women's Division Two, Hertfordshire Women's County Cup, The Round-Up and tagged Bedfordshire Women's County Cup, Beds and Herts Women's Division One, Beds and Herts Women's Division Three, Beds and Herts Women's Division Two, Hertfordshire Women's County Cup, The Round-Up on March 20, 2019 by WFEast.